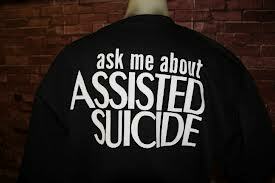 The pressure of assisted suicide………..
Everyone seems to be talking about assisted suicide but I’ve never really felt it had much to do with me, till now…………..
Today I was working from home, as I do, with This Morning on in the background. They were talking about Coronation Street and the story line where a popular character, Hayley Cropper, took her own life following her diagnosis of cancer. I don’t watch Corrie as, to me, anything north of Crawley is alien and I’m much more comfortable with Eastenders. Anyway, they said what an important issue this was and how well ITV had handled the story and how we need to talk about this issue more. I would agree with this sentiment but please let’s have a balanced, intelligent debate rather than a tear jerking, one sided view that left me with tears in my eyes and massive self-doubt! My ears had pricked up when they introduced a lady whose husband had committed suicide whilst living with MS. She described how deliriously happy they’d been before his symptoms had appeared and how devastating his worsening condition had been for him. He was constantly terrified about what his long-term prognosis was and didn’t want his wife to be burdened with prosecution if she assisted him in suicide later on. I found this horrifying for a number of reasons. Firstly, the symptoms she was describing sound alarmingly like mine (fatigue, walking lopsided, dragging his leg) so am I to start thinking about this? While she did, briefly, mention that MS affects everybody differently she didn’t specify what type of MS he had and how he knew he would end up badly disabled with it. I know lots of MSers a lot older than me whose symptoms have remained the same for years. There are so many treatments, diet options and exercise regimes that can make huge improvements and help maintain levels of ability but none of these were mentioned. She also described how he felt he was losing everything. In my experience it’s much healthier to adapt and change to your new level of ability than dwell on what you’ve “lost”. I still consider I have quality of life even if other people don’t! I also prefer to remain cheerful and optimistic for the sake of those around me who are also living with MS.
Whilst I sympathise and empathise with what he went through I would have liked a more balanced representation. I would like to have been sat on the sofa next to her to present a counter argument about how much quality of life some MSers feel! The bit that particularly stung me was when she said, “he did it because he loved his family, he felt he was going to be a burden” Does it mean that I love my family less for not feeling like this? Am I being selfish? Should I consider them more and make similar plans? Surely my children need their Mum however disabled I am? One good point she made was that if the law was changed to make assisted suicide legal some people may live longer as they wouldn’t feel pressure to take their own lives while they were still able to. I still worry about the pressure people may feel to unburden family and society though. I sometimes despair for people newly diagnosed who have to listen to this kind of representation in the media. Luckily I have reached a level of acceptance that allows me to get out of bed every day and not think about what may or may not happen in future. ← Are social media “friends” really friends at all?